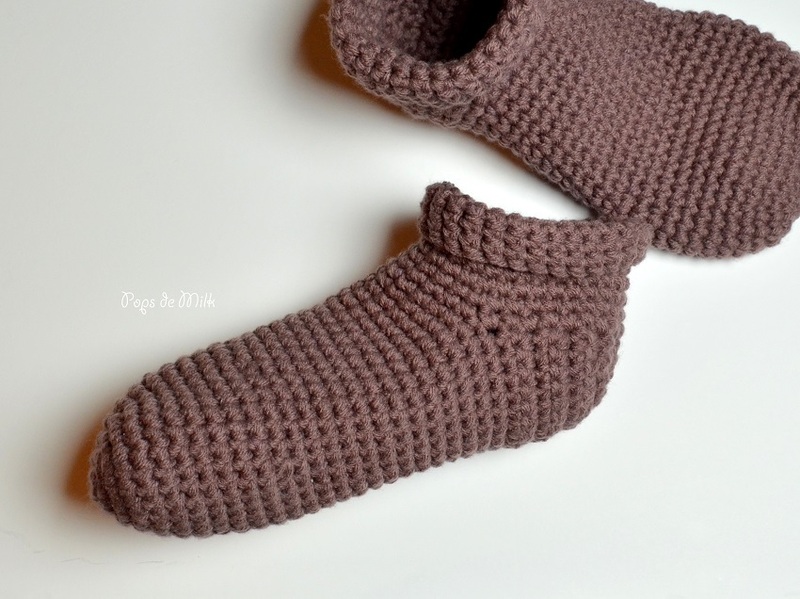 Remember when I made these oh so cozy crochet boot slippers? Me too, they were going to keep my feet warm all winter long. And then Jason saw them. 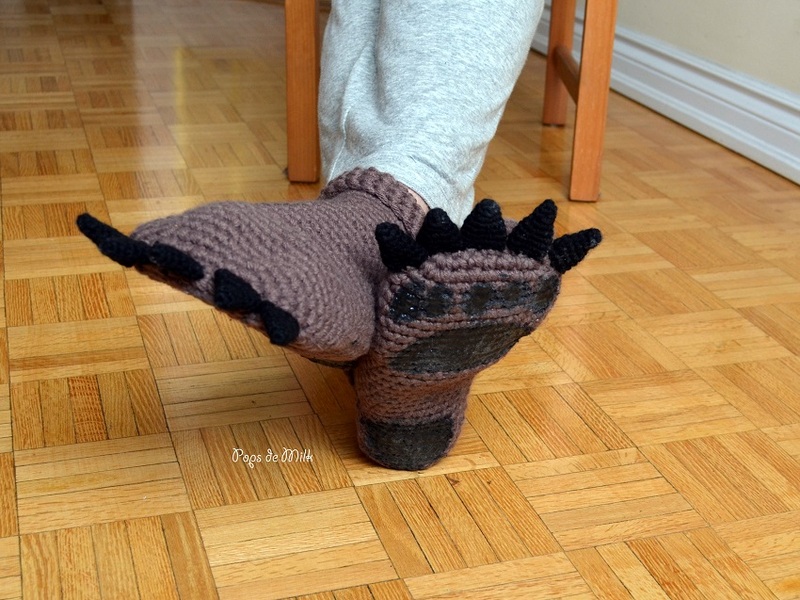 And he wriggled his feet into the slippers, wondering why they were so small. I do believe he actually said, “They’re super warm but they’re too small.” I stared at him, debating whether to tell him they were meant for my feet or letting him keep them. The look on his face, so full of joy and contentment, told me I’d have to pry the slippers off his cold, dead feet first. So I shrugged and he kept the slippers. Two years later there are holes in the heels, which would have been the ankles for me. Jason showed me the state of “his” slippers and that maybe it was time for a new pair so naturally I agreed but they had to be “special” and the first thing we came up with were bear slippers! 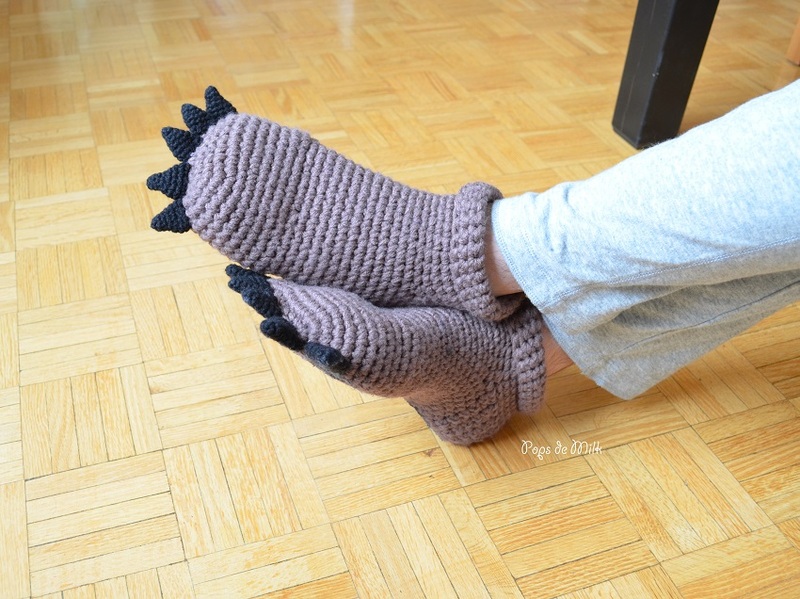 Making these bear slippers, like the birthday socks, proved to be quite challenging and I felt like I was undoing more than doing. But the thing that really made these progress slowly was a moment of crochet cockiness when I thought, “I’ll remember, I’ll know what I’m talking about when I go back and review.” (If you follow me on Instagram you may have seen how I overlapped 2 or possibly 3 patterns thinking I was working on one…). I learned a very valuable lesson to always take careful notes. But once I had the design figured out and one slipper was finished the rest went by smoothly. For this pair of bear slippers I decided to experiment with Plasti Dip for the paws, which I will blog about in a future post. Pattern Notes: Foot and Leg are worked in rounds, join with slip stitch at end of each round, starting chain does not count as a stitch. 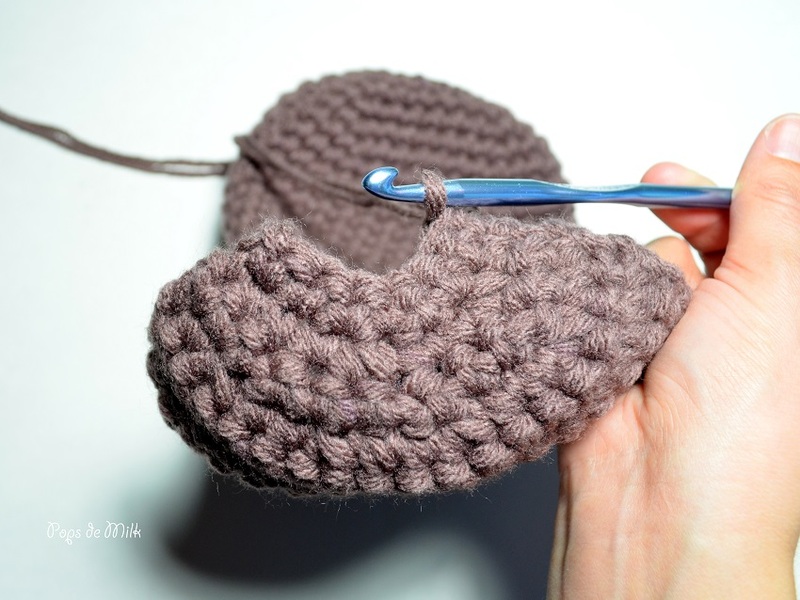 Heel is worked in rows, turn at the end of each round. Claws are worked in continuous spirals, do not join and do not turn at the end of each round. 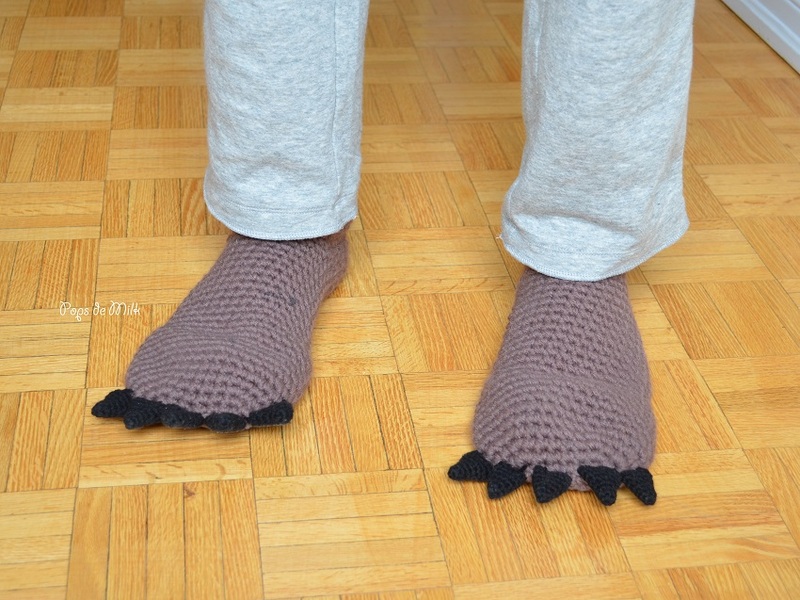 Variation: Change the yarn colour and make these into monster slippers! Pattern fits mens size 10 shoe. Size can be adjusted by adding or taking away rounds. Be sure to try on as you go along. 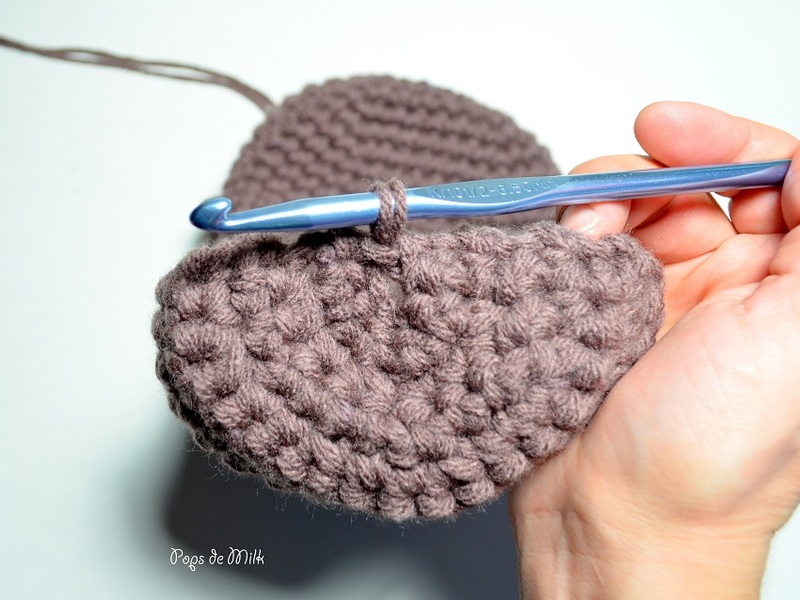 Close heel by joining with slip stitch to first stitch. With heel and sole facing you and toes pointed down you will now make the leg. Fasten off and leave a long tail for sewing to slipper. To differentiate between big toes and pinky toes you can add or take away rounds. For example, for the pinky toe you would only complete Rounds 1-6.